It is important to empower someone you trust to make decisions on your behalf and in your best interests if you become mentally incapacitated. Losing mental capacity isn't always something that happens suddenly - it can set in over time, such as in Alzheimer's Disease. If you become mentally incapacitated, you will need to apply to the Singapore Courts for appointment of a deputy to make decisions on your behalf. The application process for this can be lengthy, costly and stressful. 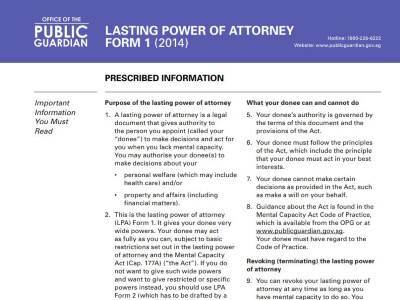 Therefore, the ideal time to make a Lasting Power of Attorney is now, while you are mentally sound.